Since 1996, the Boisé® brand has achieved the status of a worldwide leader in designing and producing premium innovative oak alternatives. As a pioneer in precision winemaking, Boisé® brings to the market reliably consistent French oak chips recognized worldwide for their high quality. Our experts have a deep understanding of oak and wine interactions. The Boisé® range forms a selection of 11 complementary chips that can be assembled to serve as a basis for the winemaker in creating wine profiles. Each chip has very specific organoleptic characteristics that allow the winemaker to directly impact aromatic profile and balance on the palate. The Boisé® brand shares the same vision in winemaking as its parent company Vivelys: the art of integrating innovation at the heart of the production line in order to enhance and customize the heritage of wine. Innovative products such as the newly released SC100 or unrivalled DC310 developed by Boisé® are the perfect illustrations of this. Perfectly calibrated and blended, each product in the Boisé chips range has its own signature. They are designed to finely tune the structure of your wines. The oak barrel is the benchmark tool for premium winemaking with its slow addition of oxygen and gentle extraction of oak components that enhance a wine’s flavor, complexity, and mouthfeel. But for all its benefits, the uncontrolled inputs of oxygen and oak components can be a problem for certain wines that require a more customized approach. Although the barrel is a very useful tool for certain wine styles, other styles may need a greater level of control that cannot necessarily be achieved with a barrel. Thus, Vivelys set out to understand each part of the process interactions between oak and wine as well as wine and oxygen. “We wanted build knowledge, understand every part separately, and then bring them together,” explains Fargeton. A barrel’s first purpose is to be a vessel that contains wine, and research shows that wine only penetrates 2-4 mm of the barrel bringing approximately 25 grams of oak compounds per liter into contact with the wine, and only half of the oak compounds are extracted in the first year of use. Whereas wine will fully penetrate even a thick winemaking stave and allow for a more efficient absorption of oak compounds. The phenolic and aromatic compounds affecting wine profiles make up 5-10% of untoasted oak, and analysis of barrel flavor profiles revealed huge differences depending on toasting levels. Furthermore the compounds contained in the oak can vary widely not just between oak species and forest locations, but even more between individual trees, making consistency and predictability across barrels very difficult. During the winemaking process the wine that comes into contact with oak also affects the intensity of flavor profile imparted. Using oak during alcoholic fermentation generally decreased the sensory intensity of the oak flavors, except smokey/toasted oak profiles. “If you have the time, I recommend adding oak after alcoholic fermentation to not waste the potential of the oak,” says Fargeton. Recent research also shows that the level of oxygen wine is exposed to in the barrel isn’t uniform across time, and up to 25% of the oxygen exposure of a one year ageing happens in the first month. This Oxygen Initial Release (OIR) is from oxygen contained in the oak, but after two months the permeability or Oxygen Transfer Rate (OTR) of the barrel determines the amount of oxygen the wine is exposed to. While micro oxygenation during oak integration generally decreases the intensity of oak characteristics in the wine, it also enhances the mouthfeel perception. And the exact dosage of oxygen greatly impacts how the lees influence the mouthfeel of the wine. Vivelys developed the range of Boisé oak chips and new Inspiration staves with specific and reliable oak characteristics that winemakers can use to get consistent and predictable results in combination with their Visio micro-oxygenation tool, bringing together the benefits of barrel ageing at a lower cost and higher level of control with the option to customize to process the specific needs of the wine and the winemaker’s goals. Vivelys has a strong U.S. based consultant team that provides technical field support to help winemakers leverage the full potential and achieve optimal oak wine integration for their target wine profiles. Boisé staves and oak chips are distributed by G3 Enterprises in the United States. For more information or samples, please contact G3 Enterprises, at G3.Info@G3enterprises.com. Any inquiries, please email G3.Info@G3Enterprises.com. Boisé staves and oak chips are distributed by G3 Enterprises in the United States. Customer technical consultations available at your service. If you want to join the next Technical Seminar in Paso Robles and Napa the week of March 18th, please contact G3 Enterprises, at G3.Info@G3enterprises.com. MODESTO, Calif. (January 28, 2019) – Following the highly-successful launch of its Boisé Inspiration line of 100% French oak staves at last year’s Unified Wine & Grape Symposium, Vivelys returns to Sacramento to introduce three new premium staves as part of the Boisé Inspiration product line. The staves are unique to the market given their ingredient approach, which guarantees consistent results from one vintage to the next. “Demand for the Boisé Inspiration staves has been great, and we are excited to introduce these three new products to help winemakers achieve their desired profiles,” said Francois Margot, Vivelys’ U.S. Manager. Boisé Inspiration #07.3: a 7mm stave which increases complexity and brings smoothness to the mouth. Boisé Inspiration #20.1: a 20mm stave which strengthens fruit and concentration in mouth feel. Boisé Inspiration #20.3: a 20mm stave which intensifies the elegance of wine and its richness in the mouth. Like all Boisé products, the new Boisé Inspiration staves are manufactured in Aire sur Adour, France. The production site is certified PEFC and ISO22000. The staves are the latest product resulting from Boisé’s relentless focus on research, innovation and product development. Both Boisé Inspiration staves and Boisé oak chips are made from 100% new French oak. Boisé relies on the latest production technology when manufacturing the staves, including analytical sorting of raw material, precise heat processing and oak-wine interaction experience. All of this is backed by its own field support to ensure consistent performance, precision oak profiles and desired results on targeted wine profiles. #1413 or G3 Enterprises’ booth #1502 at the Symposium. During Unified, attendees can also learn more about the new Assistant Visio program which enables the user to provide the exact amount of oxygen needed by the wine to optimize aging. Not only is the aging process shortened by the oak, but aromas are better integrated and the tannins are softened. By focusing on the tannins, Visio can increase the aging potential and protect the wine from oxidative risks enabling it to be aged in an optimal, totally secure manner. The Vivelys group accompanies wine-makers in production and proposes innovative solutions for wine technology, consultancy, and wood. Vivelys makes 70% of its turnover on the export market and invests 10% in research and development. The company is situated near Montpellier and is present directly, or via a network of partners in more than 20 countries. Vivelys has recently received 2 innovation awards: the Prix de l’Innovation (enology category) at ViTeff-France 2017 and the 2017 WINnovation Awards from Business Journal USA – for the technical solution Cilyo® (a tool for controlling oxygen management). For more information, visit: www.boisefrance.com/us/, email usa@vivelys.com or call 1-707-546-2213. G3 Enterprises is an industry-leading packaging manufacturer and logistics provider. G3 Enterprises leverages its wide breadth of expertise to help wineries by focusing on innovation, quality, and technical services for all its clients. The company offers exclusive products and services in the following areas: custom and stock closures with a wide range of options; custom label printing; warehousing and third-party logistics services; transportation; full-service bottling (on-site and mobile capabilities); winery services; glass distribution; bottle etching and decorating; and comprehensive technical and lab services. The 2018 grape harvest began a few weeks later than in past years on the North Coast, but with almost everything in, growers are reporting increased yields of high-quality grapes. The longer hangtimes without heat spikes or wet weather complications appear to have resulted in a very even ripening with a good balance between sugar, acid, and tannins. Vivelys is known for their expertise in precision oenology and the interaction between oak and wine. For more than 20 years Vivelys has specialized in producing oak barrel alternatives that deliver consistent results within specifically targeted flavor profiles. They have undertaken groundbreaking research to analyze and identify the oak compounds that impact wine profiles. In years with difficult harvests Vivelys’ products provide control of the consistency and flavor profile of their customers’ brands, but in good years they can help wineries reach the highest expression of their wine style. At the Unified Wine & Grape Symposium in Sacramento this year, they introduced the expansion of the Boisé® oak chip line with the Boisé® Inspiration line of 100% French oak staves. These two new Boisé Inspiration 7mm staves, #07.1 and #07.5, were created with two distinct profiles that reflect the demands for maturity and fruit balance on the palate seen in the U.S. market, and based on the same research and selection process that guarantees consistent results. 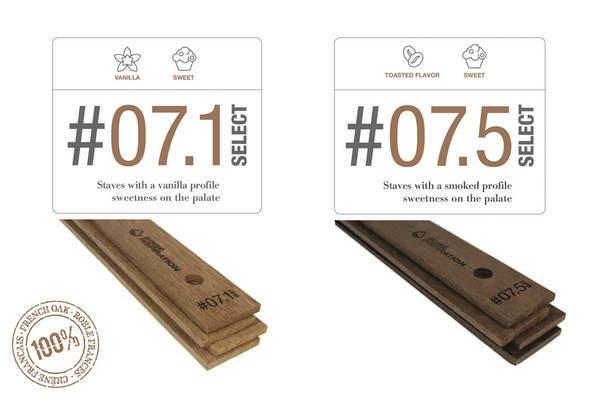 The Boisé Inspiration stave #07.1 provides a sweet profile in the mouth with roundness and intense vanilla notes, while the #07.5 has a more smoky profile with a very good persistence in the mouth. Vivelys plans to extend the Inspiration stave range with additional products that expand the winemakers’ options for designing their desired wine profiles, and several new products are already in production to be released to the U.S. market. “With the success and customer feedback, we’ve learned that there is a market opportunity for a third reference of 7mm staves, called #07.3, which will provide caramel and spicy notes and as always, a lot of roundness in the mouth,” explains Fargeton. Vivelys will also be introducing to the U.S. market their first two references of thicker staves in January. Vivelys will be displaying their new stave #07.3 at WIN Expo at their U.S. distributor G3’s Booth #213 on Thursday December 6th, 2018 at the Sonoma County Fairgrounds in Santa Rosa, CA. For more information or samples, please contact G3 Enterprises, call 1800.321.8747, or email G3.Info@G3enterprises.com. Harvest in Action. It's Not Too Late to Order Premium Staves! Building on 20 years of innovation and expertise in the interaction between oak and wine, Vivelys is a leader in oenological oak and a pioneer in precision oenology. Boisé by Vivelys is a line of premium oak products designed to help winemakers create precise and consistent wine profiles. Discover our range of Boisé Inspiration staves: Guaranteed precision & quality, unique know-how for your wine ageing. Boisé relies on the latest production technology and strategies when manufacturing staves, including analytical sorting of raw materials, precise heat processing and the know-how of the oak-wine interaction; all backed by its own field support to ensure consistent performance, precise oak profiles and desired results on targeted wine profiles. In addition to Boisé Inspiration staves, Boisé also provides a full range of oak chips, each with unique organoleptic characteristics. Test kits are available at G3Order.com to prepare the maceration of your wine with different kinds of French oak chips to determine your own formulation to meet exact needs. Boisé oak products are distributed by G3 Enterprises in the United States. For more information or a trial kit, contact G3 Enterprises at 1.800.321.8747 or email G3.Info@G3Enterprises.com. The phenolic and aromatic compounds affecting wine profiles make up only 5-10% of untoasted oak, and those compounds can vary widely not just between oak species and forest locations, but even more between individual trees. With such a high individual variance, “it is practically impossible to create two barrels that impact a wine’s profile in the same way,” explained Laurent Fargeton, Vivelys France Oak & Winery Product Manager to a crowd of winemakers attending Vivelys’ Branch Out – Explore Oak seminar in Santa Rosa, CA. For more than 20 years Vivelys has specialized in producing oak barrel alternatives that deliver consistent results within specifically targeted flavor profiles. To achieve that goal, they undertook a major research project to analyze and identify the oak compounds that impact wine profiles. The newly released Boisé Inspiration staves build on that same research and process. Fargeton guided the audience through the findings of the groundbreaking research that led to the creation of the Boisé precision oenology products, and then through a tasting of wines aged with the two new Boisé Inspiration staves. Two kinds of European Oak are used for barrels: Pedunculated and Sessile, and French oak forests are mostly dominated by one or the other of these main species. The barrels made from specific forests will therefore mainly consist of one or the other. The most prestigious forests, whether Tronçais, Jupilles or Darney, are all located in areas where Sessile Oak is dominant. The organoleptic analysis of the two oak types revealed why barrels from these forests are so highly rated. It showed that Sessile Oak generally contains more of the aromatic compounds like Whisky-lactone that integrate complex and interesting flavors into wine, while Pedunculated Oak is richer in tannins. However, the study also revealed that the variability of compounds between individual trees is even greater than the average species variance with some trees exhibiting super aromatics and others very little. To overcome this challenge of reliable oak quality selection, Vivelys created a system of sampling, analyzing, and sorting the raw oak based on 10 different aromatic compounds, and then applying an optimum time and temperature calibrated heating process to further decrease variability. As a result, they have been able to offer a wide range of Boisé oak chips that impart specific characteristics to the wine, and now also two different staves. The tasting included three pours each of Chardonnay and a Cabernet Franc Merlot blend, one aged with the Boisé Inspiration Range #07.1, another with the #07.5, and a control. The winemakers in attendance could then experience directly how the #07.1 stave matched its targeted wine profile by enhancing the vanilla notes, aromatic intensity and persistence, as well as roundness and sweetness in the mouth for both the red and the white compared to the control. Meanwhile the Boisé Inspiration #07.5 stave imparted a different flavor profile enhancing the toasted and smoked notes while also increasing the aromatic freshness, intensity, and persistence for both wines. 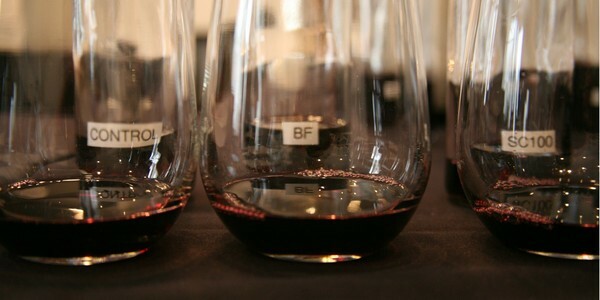 The choice between the flavor profiles of the two staves is a question of which style the winemaker is targeting and what a given vintage needs to reach that goal. However, the takeaway is that the systematic approach developed by Vivelys makes it possible to predict how each oak product will interact and impact the wine profile. Fargeton advised those new to using staves that “While wine barrels are made to be watertight, oak cut for staves break the structure of the wood, which allows for increased penetrability and compound release.” Wine in barrels will only penetrate to about 2mm, but given enough time even thick staves will achieve full penetration, so a simple surface area comparison will not be accurate. The release speed of the different aromatic compounds is not the same, so maintaining time of contact is critically important. A minimum of four months is recommended for vanilla flavors, while smoke compounds are easily extracted in two to three months. To help winemakers leverage the full potential of these oak profiles and achieve optimal oak wine integration for their target wine profiles, Vivelys has a strong U.S. based consultant team that provides technical field support. In addition to Boisé Inspiration staves, Boisé also provides a full range of oak chips, each with a unique set of organic characteristics; both are distributed by G3 Enterprises in the United States. For more information, contact G3 Enterprises, call 1800.321.8747, or email G3.Info@G3enterprises.com. Building on 20 years of innovation and expertise in the interaction between oak and wine, Vivelys has expanded their oak solutions range with the new Boisé Inspiration staves. A world leader in technical oenological oak and a pioneer in precision oenology, Boisé is renowned for their quality and ability to innovate. The development and production of the Boisé Inspiration staves follow the same rigorous technical, scientific, and sustainable procedures to create an inspired product. All Boisé oak is sourced and carefully selected from a single site in southwest France to ensure the highest quality oak. After systematic sensory and analytical evaluations, each batch is monitored throughout the transformation process to guarantee that the products have consistent characteristics. In addition to providing the highest quality products, Vivelys is dedicated to controlling and reducing its impact on the environment, which is why they promote sustainable forest management by ensuring the preservation of their biodiversity through PEFC certification. Based on an ambitious research program that started in 2009 to discover the basic rules governing oak and wine interaction, Vivelys created a production process for all their oak products to guarantee excellent integration of oak compounds into the various key moments of the winemaking process. Boisé Inspiration stave and oak chips are precisely analyzing and measuring the wood’s organic compounds, and then carefully controlling heating process, time and temperature, to decrease variability, select specific process for each material class, and to create consistent profile. Boisé Inspiration staves along with all other Boisé products are manufactured in their ISO 22000 certified facility in Aire sur Adour, France. Although Boisé Inspiration staves are carefully analyzed and measured for their organic compounds, the final arbiter is always taste, and each product undergoes sensory evaluation by Vivelys experts to ensure they conform to the desired taste perception. The two new Boisé Inspiration stave products were created with two distinct profiles that reflect the demands for maturity and fruit balance on the palate seen in the U.S. market. Boisé Inspiration Range #07.5 enhances toasted and smoked notes while increasing aromatic freshness, intensity, and persistence. It also adds to roundness and sweetness in the mouth. While Boisé Inspiration Range #07.1 enhances vanilla notes, aromatic intensity and persistence, as well as roundness and sweetness in the mouth. In addition to Boisé Inspiration staves, Boise also provides a full range of oak chips, each with a unique set of organic characteristics; both are distributed by G3 Enterprises in the United States. For more information, contact G3 Enterprises, call 1800.321.8747, or email G3.Info@G3enterprises.com. Interview with Laurent Fargeton, Responsible of Solutions for Wineries and Oak, Vivelys/Boisé France. With the new Boisé Signature products, quality and precision are specifically chosen to make your wines stand out. You are launching two new products to enhance the Boisé France line, Signature Y and Signature T. Could you talk about these two products and their origin? At Boisé, we focus on every aspect of the production process. Each new product is the proven result of many years of R&D. The current Boisé Origine range is comprised of a selection of 11 different oak chips made of 100% French oak. Each product has specific organoleptic characteristics that can be assembled to serve as a basis for the winemaker in creating wine profiles. Working closely with wineries, we have come to recognize their needs and saw an opportunity to start two new pre-blending recipes, called Signature T and Y. The new products give winemakers an easy, convenient solution. Each blend can help achieve two different organoleptic goals and work well on most grape varieties. How did you determine the two organoleptic goals and how did you prove they could be used on different varieties? We decided on the two organoleptic goals based on the different market trends we see every day: more rounded and fruity wines or more elegant oaked wines. Our initial goal was to simplify the use of our Origine range for small and medium-sized wineries. Hence, we want to make it easy for them to use and to store the products. During the R&D process, Vivelys consultants started working on three different wines to define the oak recipes that seemed to best produce these two effects. We tested the recipes through different “Oak” workshops carried out at our customers’ wineries where we were able to confirm that they produced the desired sensory effects. We tested them on many red and white grape varieties including: Merlot, Chardonnay, Cabernet Sauvignon, Grenache, Syrah, Viognier, Sangiovese, Carménère, Malbec, Tempranillo, and etc from France, Italy, Spain, USA, Chile, and Argentina. That’s a wide range of wines. Are these two products always used in the same way? No, the use of two products is similar to our Origine range. Winemakers need to adjust the dose according to the desired goal. Signature Y, the blend bringing fruity notes and roundness, can be used in doses between 1 and 3g/l. Oak notes will appear if higher doses are used. Signature T, the blend bringing elegant oak characters, should be used in higher doses, between 3 and 5g/l. An interesting point about T and Y is that they can be combined with other products of the Origine line to obtain more customized wine profiles. Could you tell us more about Boisé France? Boisé France was founded more than 20 years ago. The aim was to offer an oak-related tool that would adapt to wines and benefit them with everything that contributes to the richness of a wine, but without predominance of oak over other characters. The core of our offerings has always been the precision and reproducibility of results. Vivelys consultants help customers create their own recipes through our oak workshop. To talk with our consultants, please contact Cecilia Cunningham at cc@vivelys.com or Leslie Renaud at lr@vivelys.com. To obtain samples of Signature Y and Signature T, please contact our North America distributor, G3 Enterprises at G3.Info@G3Enterprises.com. Oak barrels are beautiful vessels for wine that also serve the purpose of adding oak characteristics to the wine, but sometimes a winemaker’s vision calls for a specific set of wood flavors and aromas to be imparted to the wine, and to achieve that vision tools of precision oenology like the Boisé oak chips have to be applied. “With barrels you decide by toasting level, and while toasting modifies the organoleptic characteristics of the wood, the wood had characteristics already that were not even considered,” explains Laurent Fargeton, Product Manager at Vivelys. Vivelys, offering innovative solutions to precision winemaking, has developed a range of 11 different Boisé oak chips that each departs unique organoleptic characteristics to the wine. Each oak chip has its own set of characteristics developed through diligent research and reproduced by precisely analyzing and measuring the wood’s organic compounds, and then carefully controlling toasting time and temperature to create a consistent product. Although every Boisé oak chip is carefully analyzed and measured for its organic compounds, the final arbiter is always taste, and Vivelys has developed a vocabulary for talking about the different tastes. They share this method with the winery, so that they can set up tasting panels and have productive conversations about the flavors they experience and how they match up with the objectives for the wine. 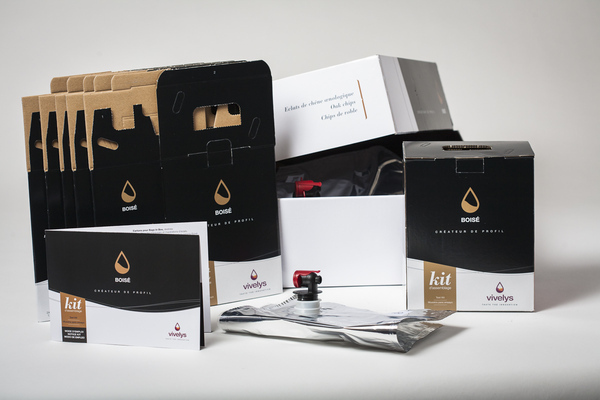 A Boisé test kit comes with eleven bag-in-boxes and 10 oak chips from the Boisé product range plus a control box. After the wine has sat in the 3L boxes for two months, the winemaker and tasting panel can begin to taste the effects of each oak chip on the wine. After tasting through all the test samples, the winemaker and team with guidance from a Vivelys expert can identify the samples that work toward the stated objective and begin to blend them to create the right recipe. For example, if the goal is to enhance the wine’s fruitiness and aromatic intensity, as well as its sweetness and mouthfeel, but without adding toasted notes, a combination of the BF and SC100 oak chips could work well. But if the winemaker is looking for a bit more complexity with slight toasted notes, perhaps a combination of BF and DCA would be a better fit. When the winemaker has chosen the preferred blend, the Vivelys expert translates that back into the precise mixture of Boisé oak chips needed to impact the wine for the desired result and guides the winemaker in how to use it. For more information, contact G3 Enterprises, a distributor of Boisé® oak chips in the United States. Order now online, call 1800.321.8747, or email G3.Info@G3enterprises.com. Even though California is still under the influence of the drought, 2016 is certainly one of the most promising harvests California has seen in a decade thanks to “almost” ideal conditions: sufficient reserves of water as well as excellent growing and ripening conditions. Harvested grapes were of high quality and the wines obtained after AF seem to confirm such trend. However, even if this year has given extraordinary grapes, these should still reveal and, above all, preserve their potential in order to make of 2016 an exceptional harvest. Below are some clues to apply in the wine ageing process to optimize and prove the value of the potential the 2016 harvest wines have. The excellent ripening conditions have make it possible to develop, in most cases, aromas evocative of ripe fruit. As a result, wines produced are highly aromatic and sweet, though sometimes a little out of balance on the finish due to the alcohol, which may give the wine aggressive sensations. Ageing on lees may alliviate that aggressive character while increasing the volume on the mid palate. More over, due to their antioxidant effects during the ageing step, lees guarantee wine stability and greater aging potential. The continuous stirring of fresh lees during the ageing period will lengthen wine/lees contact and optimize its benefits. According to the openness, it will be possible to make a combined oxygen supply at 0.75 – 0.25 ml/l/month. Continuous stirring of fresh lees or autolysis during 2 months. Combined oxygen supply at 2.5 ml/l/month. Optional addition of SC100 and/or DC190 at 1 g/l. Ageing is the final step of the wine making process. It is the moment to make the “final touches”. The 2016 red wines are quite colored, highly aromatic, with a pronounced but not aggressive tannic sensation. It is therefore an excellent base thanks to which ageing will allow to refine the details that make the difference between a good and a great wine. Oxygen, at moderate doses, will be able to round the tannins, smoothing them. It will also make the wine more resistant to oxidation. Winemakers also have the option to use oak. The combination of different types of oak with precise and complementary characteristics allows to improve the resulting wine and to obtain a style adapted to the targeted market. If grapes are too ripe, sugar and alcohol may bring a sensation of heaviness on the palate. In the case of quality grapes, for achieving intensified aromas and a strengthened wine structure, it is recommended to use chips that amplify the volume on the palate (such as BF and SCA) and that bring a wide range of aromatic notes (for example, 1 g/l BF + 2 g/l SCA + 0.5 g/l SC180XL + 1 g/l DC190 + 0.5 g/l DC310 – you should adapt the dosage with a KIT Bois according to your goals). The Batonneur XL, created by Vivelys, is the ideal tool to stir the leesgently, without oxidizing or degassing the wine, and without losing aromas. It will maximize the wine/lees contact, so as to increase fat and stabilize your wine. It has been designed for tanks of13000 –66000 gallons. With our Boisé Test Kit, you can test each reference individually on the wine you wish to treat with our products. Then you candesign your own blends, perfectly adapted to your aimed product. There are countless combinations and our consultants can help you refine the recipe. The Boisé Test Kit contains all the necessary materials to make these blends.